Apple has announced a $2.65 a share dividend and a $10 billion stock-repurchase program. Updated with news from Apple's conference call. CUPERTINO, Calif. ( TheStreet) -- Apple ( AAPL - Get Report) overhauled its cash strategy before the market open on Monday, announcing a dividend and share-repurchase plan. The tech giant aims to pay a quarterly dividend of $2.65 per share, sometime during its fiscal fourth quarter, which begins on July 1, 2012. The Apple board also authorized a $10 billion share-repurchase program, starting in the company's fiscal 2013, which begins on Sep. 30, 2012. "This will broaden Apple's investor base by attracting more investors who do not currently hold Apple's stock," explained Apple CEO Tim Cook, during a conference call before the market open on Monday. Apple, he added, will periodically review its dividend and repurchase plans. The iPhone maker stopped paying a dividend in 1995, but Cook hinted that Apple may reverse its stance after assuming the CEO role last year. Apple, which recently unveiled its new iPad, had a cash hoard of almost $98 billion at the end of its recent fiscal first quarter. Some $64 billion of the company's cash is offshore, according to Apple. 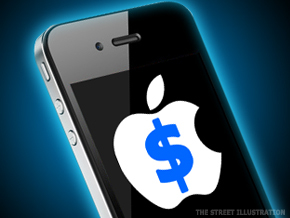 In a recent poll conducted by TheStreet, some 70% of respondents said that Apple should start carving off its cash haul. Almost a third of respondents, however, said that a dividend's not necessary, noting that that the iPhone maker has better uses for its cash. Dividends have become more common in the tech sector in recent years, with Apple and Google ( GOOG - Get Report) among the handful of large-cap names eschewing payments. Microsoft ( MSFT - Get Report), for example, reversed its dividend stance and made its first payment in 2003, while Cisco ( CSCO - Get Report) announced its first-ever cash dividend last year. Critics of an Apple dividend, however, have pointed to the company's return on equity, need for innovation and potential future acquisitions. Apple's shares, which surpassed $600 last week, have climbed more than 47% this year. -- Written by James Rogers in New York.